My city breaks and treats are not would I would call “exotic”. Others may head south to Nice or Marrakech for some late winter sun or to Vienna or Berlin for museums. I headed north to Edinburgh for some woolly fun. And what fun it was! I deliberated over whether to go to Edinburgh Yarn Fest for quite a while but eventually I just booked a ticket. Through the dark winter months I looked forward to the weekend but tried not to get too excited. 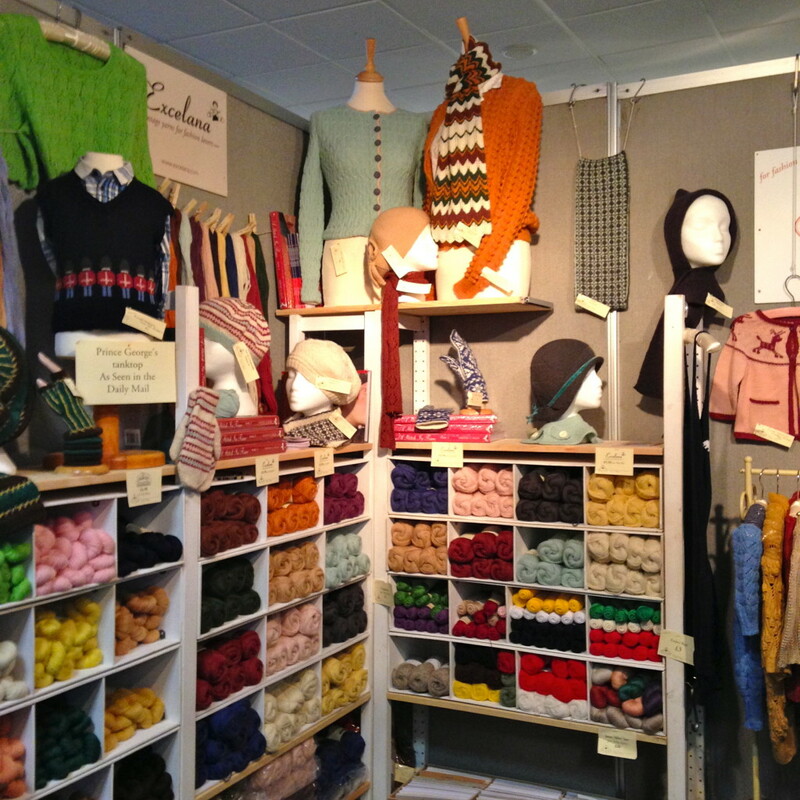 After all, it might be like the London knitting show I had visited last year: an overwhelming bastion of commercialism. As soon as I entered the Corn Exchange, any concerns I had evaporated. A volunteer checked me in and handed me a weekend wrist band. Not being a regular festival goer of any type, I must have looked a little bemused at the reinforced paper band as a chirpy volunteer helped me put it on and explained it was water and sleep proof. Before diving into the woolly wonders I stopped for a fortifying cup of tea. I entered a large hall. There was a food and refreshment counter at one end and a pop-up stalls in the far corner but for the rest, it was given over to knitters. Plenty of tables and chairs meant knitters could sit down for lunch, a cup of tea or just to knit and natter. 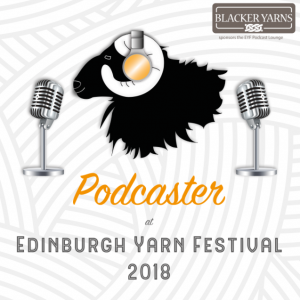 Another section of the hall was devoted to the Podcast Lounge, a space with comfy sofas organised by Louise Scollay of the KnitBritish podcasts and a fierce advocate of the amazing diversity of yarns grown, spun or dyed in Britain. The lounge was an inspired idea! Louise had developed an informal programme for the weekend but the area mostly served as a space for relaxed knitting and chatting. Perfect for introverted knitters who were visiting the event on their own. On Saturday I spent a fair amount of time in the lounge. 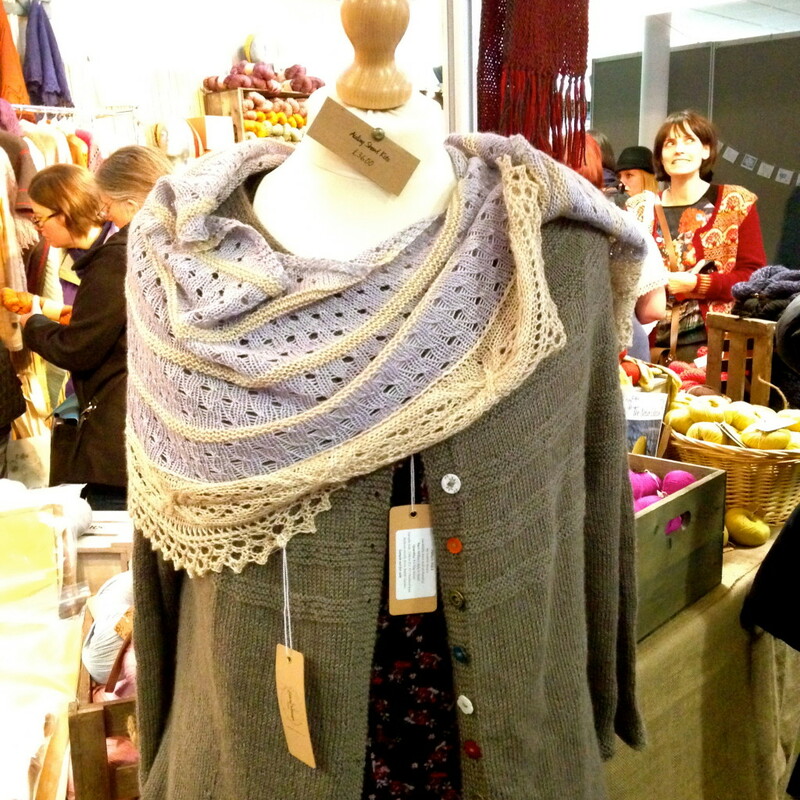 I squished sample swatches that Louise had knitted up in different yarns to show case the range of woolly goodness in the British Isles, or simply caught my breath after the bustle of the Marketplace. It was obvious that the organisers were knitters rather than an anonymous events company. Only avid knitters would allocate so much space for knitting, chatting and meeting up. As my wartime clothes rationing experiment extends to handmade clothes, my yarn shopping would be curtailed by budget and nominal coupons too! I had therefore come armed with lists: projects with their yarn requirements; specific wools; yarns to inspect for future online orders; and a list of patterns. Hunting out the patterns first allowed me to get my bearings. I know we can buy e-patterns on Ravelry these days but there is something lovely about reading and digesting a physical pattern. I came away with gorgeous ones by Karie Westermann (including her stunning Byatt shawl) and Joanne Scrace (who designed the Bletchley Collection, inspired by the home of the Second World War code breakers) as well as a book by Tin Can Knits, who understand what real women look like! Hut 8 cardigan, inspired by Bletchley Park. After a spot of lunch (and bumping into an acquaintance from London in the queue for sandwiches), I did a spot of yarn shopping. Excelana, a blend of Bluefaced Leicester and Exmoor Blueface, designed by knitting designer Susan Crawford is one of my staple yarns. I love it for its feel, warmth, stitch definition and colours, which are particularly flattering for fair English skin. Susan was there in person and very patiently helped me pick out four shades for one of her designs while we talked about her next book. Susan typifies so much of what is wonderful about the knitting industry today. Designers who love the amazing qualities of wool, source it from UK flocks and support the livelihoods of farmers, spinners and dyers. Next on my list were two skeins from Old Maiden Aunt, a Canadian dyer based in Scotland, who produces the most lusciously coloured hand-dyed yarn. I dithered endlessly over the gorgeous tones before settling on a garnet red and variegated sage green. Finally there was some gift-shopping, picking up skeins here and there for friends and acquaintances. At one stall I was chatting with the vendor about the provenance of his undyed wool and he very kindly jotted down the names and locations of the flocks that had contributed to a single skein of wool! As I left the festival at the end of the first day, I was reassured about how diverse and interesting the yarn and knitting sector is. Supermarkets, Amazon and online shopping may be decimating our high streets but, if anything, the Internet seems to have created opportunities for the yarn and knitting scene. 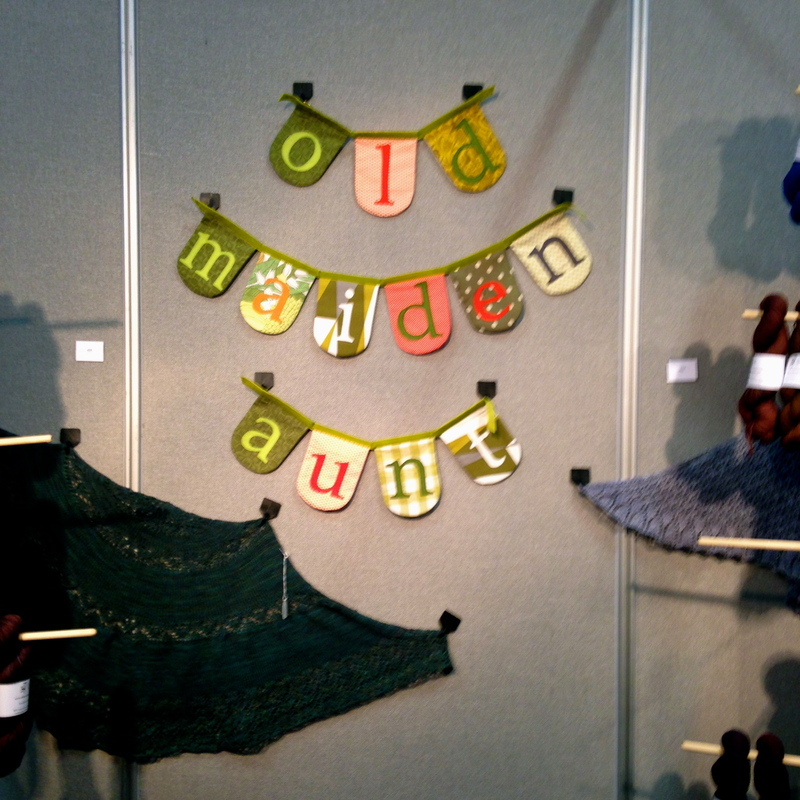 On Sunday I returned to the festival for some knitting, company and a workshop. Settling into the Podcast Lounge, I listened to Louise Scollay in conversation with Karie Westermann, a designer with an amazing aesthetic who has some intriguing new projects up her sleeve. I chatted with other knitters. Strangers from Scotland, England, France and Belgium, all with a shared passion for garments that are the polar opposite to fast fashion: clothes formed out of the skill and imagination of farmers, spinners, dyers, designers and ourselves. The weekend finished with me and another 18 women tackling years of muscle memory in Karie’s workshop on continental knitting. My new purls are still quite ragged but this arthritis-friendly way of knitting opened up the joys of colour work for me! My learning was not, by any means, limited to the formal workshop. Over the weekend complete strangers introduced me to lifelines, shared blocking tips and showed me how to work with beads. Having come from a legal background where knowhow is often jealously guarded, it never ceases to amaze me how generous knitters (like gardeners) are with their knowledge. 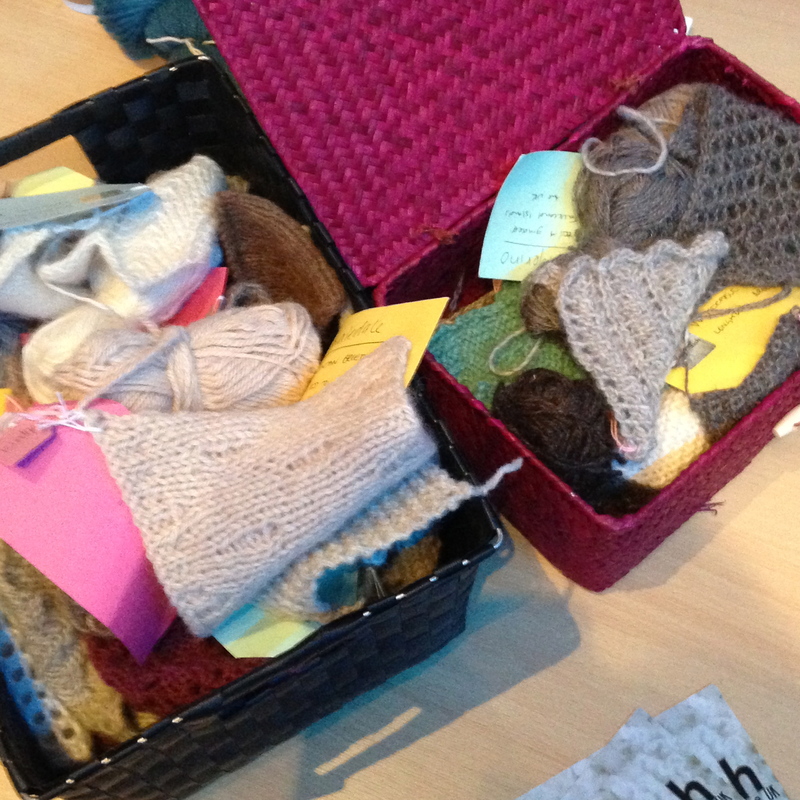 Maybe we just realise that knitting is not a commodity but that we are part of a shared heritage. And judging from Edinburgh Yarn Fest, it is a vibrant, living heritage! I don’t even know how to begin to express what positive feelings reading your account brings forth for me! I love your ending comments about shared knowledge and generosity ruled the fest rather than commercialism. I think you would have loved it! So many inspiring, creative, uber-skilled, independent, bold women, and the occasional chap too. It was joyous to be amongst people who just get it: materiality, provenance, “invested” garments… Definitely need to work on those heel clicks for the next one!!! 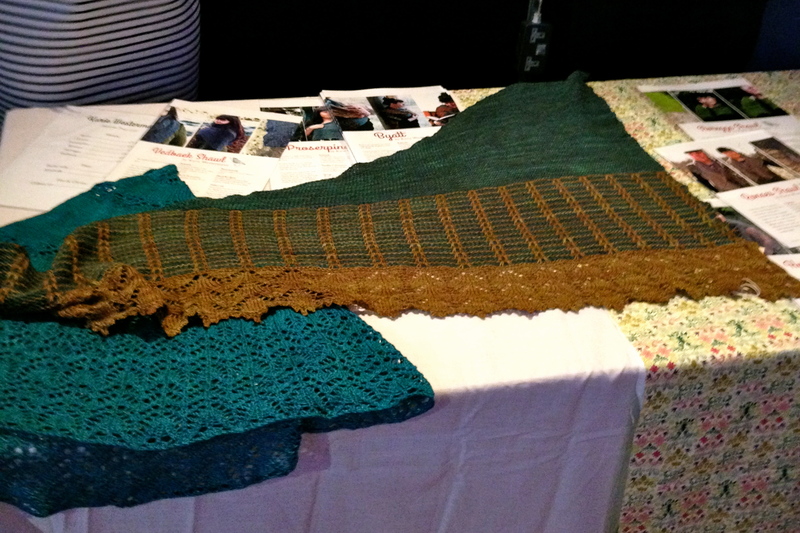 I want a Byatt shawl! Possession is one of my all-time favorite novels. This looks like such a fun event. I had never given much thought to the farmers that make this gorgeous wool possible. (Not sure where I thought wool came from…) They are heroes! I agree knitters ARE very generous–and quietly rebellious. I have a friend who is both an avid knitter and a librarian. She is tough (in a good way)! I think the leap from being curious about the provenance of our food to the provenance of wool, cotton… is a very small one. Certainly in the UK sheep farmers have had a rough time for decades. For many years the cost to farmers of sheering the sheep outweighed the value they could get for the fleece. And at the same time people are wearing acrylic. This synthetic fibre, derived from petroleum, is not in the least bit warm meaning people turn up central heating, burning even more fossil fuel. Complete madness! And yes, knitters are definitely gentle rebels! It was really lovely to meet you. I wish I had known about your wartime project, so interesting. I was a big fan of the series the land girls and the bomb girls. I will definitely read up on you blog on it. Eensgelijk! Het was zeer fijn om met je te babbelen! Ja, de Tweede Wereldoorlog is een inspiratie. Ik probeer nodeloze nostalgie te vermijden maar ecologisch gezien, kunnen we ontzettend veel van die periode leren, en van de vrouwen in het bijzonder. Ik werk momenteel aan een boek over mijn experiment en ‘levende geschiedenis/patrimonium’. Breijen maakt heel zeker deel uit van dat patrimonium! I was lucky enough to spend the weekend at Edinburgh Yarn Fest and I completely agree with your sentiments on the internet providing a growing market for independent sellers rather than just going to Amazon or the like. I love supporting independent makers/dyers/crafty people and it was lovely to get so many of them in one room!